My students love SCIENCE this time of year, and so do I! The Science table is always full of gourds, pumpkins, Indian corn and Fall leaves..
One of our favorite activities is learning all about the life cycle of the pumpkin. It is a great way to introduce new vocabulary as well! 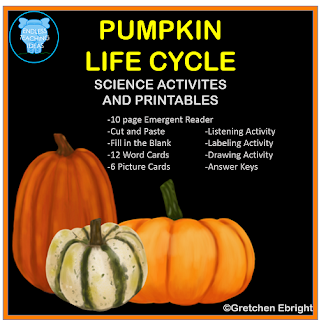 This packet is a great addition to your Science activities this Fall! Jump on over to my shop to grab the Pumpkin Life Cycle packet and download this FREEBIE to go along with your Fall Science Lessons! Then click on the GREEN STAR to follow my shop to receive reminders about freebies, sales and new product postings! Feedback welcomed!